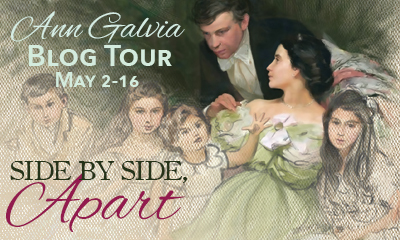 Today I’m pleased to be hosting Ann Galvia with her last guest post on the Side by Side, Apart blog tour. 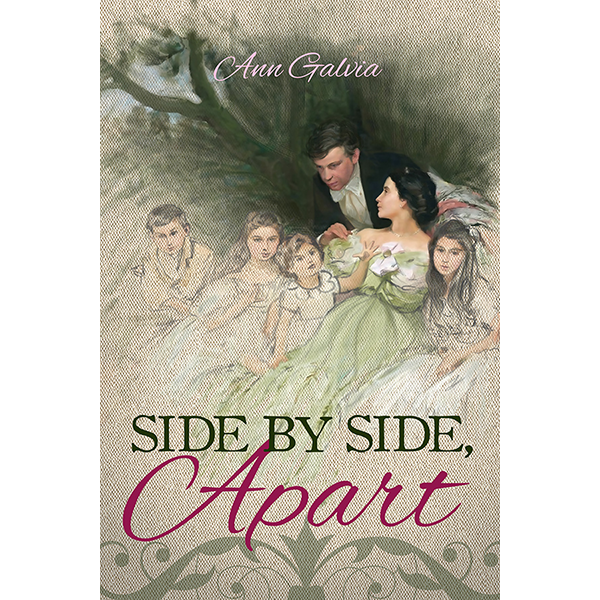 And that brings us to the present day, Side by Side, Apart was written, released and Ann Galvia would like to share with you all how Northanger Abbey and Persuasion were present in her mind while writing it. This will be my final guest post during the Side by Side, Apart blog tour! (Fear not, though…still 4 more stops after this one!) Thanks to Rita for giving me this fourth opportunity to talk about my debut novel, Side by Side, Apart! If you have been following along since May 2nd, then you know I have been using the blog tour to talk about the various ways Jane Austen’s other novels were never far from my mind when writing Side by Side, Apart. Even though it’s a story about Elizabeth and Darcy, there are still influences from Sense and Sensibility, Mansfield Park and Emma woven throughout. So if you know me by now, you are probably wondering who got named after characters from Northanger Abbey and Persuasion. And this is where I throw my curveball because it’s no one! Perhaps more surprisingly, my second favorite Austen novel is Northanger Abbey. After I read P&P the first time, I immediately read Austen’s other completed novels. For me, Northanger Abbey was an immediate favorite. I enjoyed it just as much, if not more, than Pride and Prejudice. But I think P&P has more re-readability. I love P&P just as much every time I read it. Northanger, I only really loved the first time. I will always enjoy it enough to rank it my #2 Austen, but the humor isn’t as powerful on re-readings as it was on the first. Because I read and loved NA before I ever sat down to write JAFF, when I did, I always liked to throw an NA reference in there somewhere. More often than not, this is just Elizabeth Bennet reading a Gothic novel. In this spirit, there are a few conversations about how women just love stories where a man spirits the heroine off to a decrepit castle on the continent in Side by Side, Apart. Between references like that and all the theme-naming of original characters, it occurred to me that I needed a Persuasion reference as well. Here’s another confession: Persuasion is my least favorite Austen novel. Unlike Austen’s other works, Persuasion is not a coming of age story. Anne Elliot is wise, mature and knows exactly who she is. She doesn’t grow or change over the course of the story. No matter how much I love a writer, I don’t find stories where the central character doesn’t undergo some kind of transformation to be very interesting. Wentworth’s letter was romantic, but it wasn’t nearly enough to make me forget about how poorly he’d behaved during the rest of the book. Still, I needed some nod to Persuasion. But I was out of new characters and had no ideas for ways to throw a reference to Anne Elliot into the dialogue… In the end, there’s one nod to Persuasion. Blink and you’ll miss it. Sorry, Persuasion, I’m just not feeling you. Edmund Wickham is in the Navy. I guess you can tell yourself that he’s an homage to Wentworth instead of William Price if you really want to. I find it unlikely Edmund will ever show the kind of promise and success of Wentworth’s career, though. But then again, Edmund’s future life is just as much of an open book as anyone else’s. There’s really no telling where his life will lead. But that’s the fun of fanfic, isn’t? The book is over, but life is still wide open. That’s it for me on the Side by Side, Apart blog tour! Still four more stops to go and more chances to win your very own copy! I hope you’ll follow along! Thanks so much for hosting this day of the blog tour! Thanks Rita for this post and Ann for the giveaway. I love the concept of this book and it is on my wish list so I would love to win a copy. I really feel for both of them in this as poor Darcy now has to win her all over again and she has to try and remember what made her love him enough to marry him. Love it. Loved this post, Ann and Rita, thanks. Fascinating premise, I can’t wait to read this book! So much that I’d like to know about how it all came about and how are they’re going to deal with such a complex situation! Congrats for a great book, Ann! Read this book as ‘Bruises’. It’s hard to imagine Elizabeth not remembering that she’s Darcy’s wife,that they are very happily married and they she’s a mom. I have not read this book but it sounds wonderful!!! I really want to read this again [I loved the online version] to pick out the references to other Austen characters! [And also just because it’s a great story! Lol] I don’t think I noticed them before. S&S is my 2nd favorite after P&P. Me too Monica! Then it’s Emma! Fun post that had me chuckling. I have been the opposite in my tastes for favorites. Persuasion has always been the one I adored the most and Northanger Abbey the least. My re-read of NA was what had it passing up others to become my new third favorite. Yes, I too am hearing wonderful thing about this book. I do have it on my wishlist. P&P is my all time favourite Austen book with Persuasion and Northanger Abbey following behind. I like the reference to Edmund Wickham and your comment…’I find it unlikely Edmund will ever show the kind of promise and success of Wentworth’s career, though. But then again, Edmund’s future life is just as much of an open book as anyone else’s. There’s really no telling where his life will lead.’ Do you have plot bunny in mind for another book? I loved this post and I loved this book! Now I appreciate the references to Austen’s other books too! I am also not a “Persuasion” enthusiast… Perhaps my tastes will change and the modern JAFFS based on “Persuasion” that I have read have been great. But I agree about the transformation piece,l; however, many scholars believe it’s her best work, so I hope to feel more for it one day! Question to the author: Who is the most famous person you have ever met? Isn’t it interesting how we all have our favourites amongst Jane Austen’s works? For many of us P&P is No. 1 but the order of the rest is just so variable. Persuasion is my No. 2 but NA recently jumped up the list when I re-read it for the first time in quite a few years. MP is the one I still struggle with though. Looking forward to reading this one and spotting all the little references and nods to JA’s other works. What an interesting premise. Love the review. A definite must read. It was very interesting to read Ann’s clarifications regarding her references to other Jane Austen novels. Personally I still cannot decide which novel by Jane Austen is my second favourite. P&P is a champion for me, but as for the silver I am hesitating between Sense and Sensibility and Persuasion. Though I know for certain that Mansfield park is alas my least favourite (just can;t find it in myself to like and understand Edmund Bertram). Unique twist. I can’t wait to see how our favorite couple find HEA with their whole life already in progress.